In this Paste Drink series, we take a step back from the craft beer hype cycle to offer our enduring endearments to some of our favorite beers that have stood the test of time. These beers should be considered paragons of their respective styles, and just because they’re available year round (in most cases), that never makes us any less excited to crack one open. These are the Beers We Love, and they’ve earned our respect. As a series, “Beers We Love” was created largely as a way to draw attention to “unsung heroes” of the craft beer industry. Most of these essays are dedicated to year-round beers, or offerings that have been around for 20 years or more. They’re the pale ales you remember fondly from your earliest craft beer memories; the ESBs you drank at the old pub that closed five years back to little fanfare; the non-adjunct porters that first taught you the value of “dark beer.” That kind of thing. In comparison with those sorts of beers, it’s a little bit harder to argue that something such as Oskar Blues Ten FIDY could ever be considered “unsung.” This is a beloved imperial stout, no doubt about it, and likely one that has turned almost as many people onto the style as something such as North Coast’s Old Rasputin, which is often mentioned in the same company. We’re by no means alone in our love of it. But here’s the thing—as we’ve been considering in a few ways lately, it can often feel like the world of imperial stout, and stout as a whole, has become choked by adjunct-laden beers that are desperate to generate hype and attention for their breweries in a slowing and overcrowded marketplace. In the course of these sugary, adjunct-laden pastry stouts coming into the vogue and dominating the hype cycle via hotly contested limited releases, they’ve increasingly pushed non-adjunct stouts—even beloved ones like Ten FIDY—out of the everyday conversation. You can see this evolution in Ten FIDY’s own marketing language, which calls it “the ultimate celebration of dark malts and boundary-stretching beer” on the Oskar Blues website. The “dark malts” bit you can still say holds true today, but thinking of a 10.5 percent ABV, non-adjunct imperial stout as “the ultimate boundary-stretching beer”? That almost seems quaint now, in an era when the tip-top of Beer Advocate and Untappd rankings are almost entirely dominated by 12-15 percent ABV, barrel-aged monsters with multiple adjuncts in them. Only one type of imperial stout is allowed to hold the highest ranking on sites like this in 2019, and it’s not stuff in the mold of Ten FIDY. In fact, on the entire top 100 American imperial stouts on BeerAdvocate, I count exactly one that might have neither barrel-aging or adjuncts. Its ABV: 16 percent. Sounds about right. 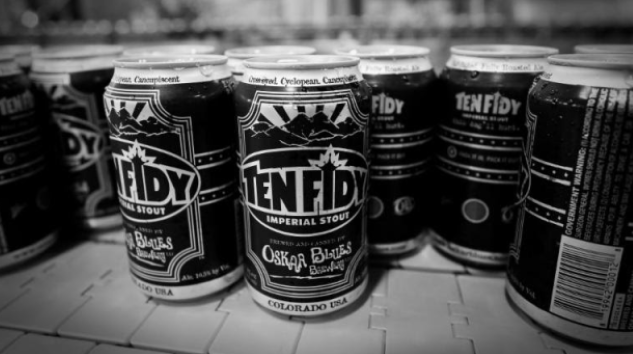 But would we ever dream of compiling a list of our 100 favorite imperial stouts that didn’t include Oskar Blues Ten FIDY? There’s not a chance in hell. This beer is too good for that. So let’s talk about what makes this classic imperial stout so wonderful. There’s something incredible about the clarity of intent in Ten FIDY, a beer that was trailblazing as one of the first widely available imperial stouts you could find in a can, in an age when most breweries were putting their “special” stout releases into 22 oz. bottles. That’s clarity of intent and not visual clarity, naturally—this stuff pours motor oil black, with a thickness you can somehow see in the glass before you ever raise it to your lips. It looks like you could eat it with a spoon. Even the can evokes the absence of light. What is that intent? To deliver an imperial stout that is assertive, pure and focused, while still allowing some room for subtlety in the wings. It gives you everything you’d expect to taste in a superlative Russian imperial stout, but then modifies them with small (but important) flourishes. On the nose, Ten FIDY presents like a classic Russian imperial stout, of the sort that first came to prominence in the U.K., but amps up its intensity in a way that is distinctly American. Burnt, ashy roast is the signature note that most anyone would call out first, followed by fudgy chocolate intensity, toasted nuttiness, caramel and a bit of almost grainy, cereal character. The roast evokes coffee throughout, but in more way than one—the roasted nuts and cocoa make one think of a classic Colombian Supremo, while the wisps of smoke evoke a far darker, oilier French roast. Somehow, Ten FIDY does both at once, finishing on the nose with a surprising evocation of dark fruit—something we perceive much more prominently after taking a sip. On the palate, one immediately notices the silky, glossy texture of Ten FIDY, something that is likely accentuated through the use of flaked oats—also something we’ve repeatedly noted in great imperial stouts from breweries such as Fremont in Seattle. Texturally, it makes this beer feel enticingly thicc, to use the modern parlance, without the use of sweetness-boosting lactose. Long-lasting roast announces itself immediately, and lingers throughout all the other flavors into a relatively dry, bitter finish. Hop flavors don’t present themselves very strongly, but you know they’re present, thanks to that bitterness, which has the dual effect of transforming this beer’s other flavors. The cocoa, for instance, is never something you’d describe as “milk chocolate” in Ten FIDY. Rather, it tastes like a very high percentage cacao bar, while also possessing some of the nuttiness of unrefined cacao nibs. Lastly, the fruit notes present on the nose open up here on repeated sips, with a lingering note of black raspberries that pairs beautifully with the cocoa. You might still call it “dessert-like” in some way, but it’s more like an extremely expensive chocolate bar than an ice cream flavor. Not to be lost in this discussion is how the presence of alcohol plays into this stout’s flavor profile. It’s a very important element—not something to be hidden, but an element that enhances the fruitiness of Ten FIDY’s finish via the flavor of ethanol itself. Drinkers sometimes have a tendency to assume that the best thing booze can be is “hidden” in a beer, but it would be very hard to achieve the same dark fruitiness if you couldn’t taste the alcohol in Ten FIDY. Here, it’s dialed in to exactly where it needs to be. All in all, this beer represents the platonic ideal of Russian imperial stout, as interpreted by American craft brewers. There’s endless ways to modify it further, but don’t let yourself forget how sublime this kind of beer is, all on its own. Where Does This Beer Fit Today? Unlike our recent essay on the seemingly endangered nature of non-adjunct, standard-strength stout, I’m not about to make any kind of case that imperial stout—even non-adjunct imperial stouts—are about to go riding off into the sunset. The upper echelons of the online ranking sites may be completely inundated with barrel-aged and adjunct-laden beers, but non-adjunct, non-barrel-aged stouts do still exist in quantity—albeit, getting less attention than they did a decade ago. That is perhaps the takeaway here. A survey of the beer landscape often makes it seem as if all craft breweries now feel compelled to get their hands on barrels of some kind—that the idea to brew an imperial stout in the first place is predicated upon having a liquor barrel for it to age in. The assumption inherent in that line of thinking is that consumers are only interested in imperial stouts if they’re barrel-aged, or otherwise cranked up to 11 on the intensity meter. That consumers have lost all appreciation for subtlety. Not only do I believe that to be ultimately untrue, it feels like this particular instance represents a moment when non-barrel, non-adjunct imperial stouts are all the more likely to stand out as novel. This isn’t to suggest that we don’t enjoy the barrel-aged versions of Ten FIDY, by the way—those beers are uniformly delicious. But you could say they’re arguably less unusual or unique than the base beer they come from, in a time when everyone is competing to see how they can make use of barrels and adjuncts in the most bombastic of ways. This is a time when “old-fashioned,” non-adjunct imperial stout should be poised for a rediscovery. Ten FIDY will still be there whenever that happens, providing a blueprint for one of craft beer’s tastiest styles. We couldn’t imagine a stout landscape without it.